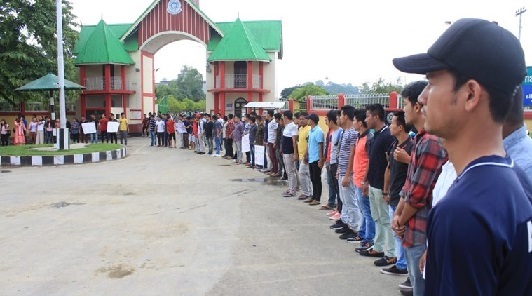 The teachers, students and staffs of Manipur University has threatened to resume agitation if the authorities don’t take action against Vice Chancellor AP Pandey by September 4. An emergency joint meeting of executive members of Manipur University Students’ Union (MUSU), Manipur University Staffs Association (MUSA) and Manipur University Teacher’s Association (MUTA)on Sundayresolved to resume agitation if “competent authority” fails to take up appropriate action against VC Pandey on or before theSeptember 4, 2018. In a press note jointly signed by presidents of MUSU,MUSA and MUTA here said that the emergency meeting also resolved that if the appropriate action is not taken by the competent authority against Pandey for his various virtual orders during his period of leave, the agitation which was suspended temporarily on the basis of the Memorandum of Agreement(MoA) signed on August 16 between MHRD(Ministry of Human Resources Development), Manipur government on one side and university community on the other in the office of the chief minister of Manipur, be resumed. On September 1, Pandey issued a letter of resumption of his duty as vice-chancellor of Manipur University with effect from September 1, 2018 to media. He also issued two official orders and one of the orders directs Prof M Shyamkesho Singh to perform the duties of Registrar of the University based on MHRD’s letter while other relating to banning of MUTA and MUSA based on Manipur University Act, 2005. However, MUSU, MUSA and MUTA in today’s joint meeting resolved that any order issued by Prof AP Pandey during his period of leave be condemned as null and void and so non-binding. A MUSU leader when contacted said Pandey will be on leave during one month long enquiry and another 15 days for action taken report of the enquiry as per the MoA. MUSU launched indefinite shutdown fromMay 30demanding Pandey’s ouster on charges of financial and administrative irregularities. However Manipur University reopened on August 23 after the MHRD approved the MoA signed on August 16.